Roller Style Aluminum Pallet Dollies move Pallet Loads quickly without the use of a Forklift or Pallet Jack. 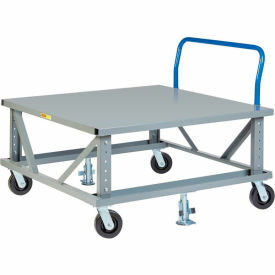 Roller Style Aluminum Pallet Dollies are made with an aluminum channel frame for strength. Dollies provide smooth transport of large pallet loads, and are available with Tilt Rollers that allow the Dolly to turn or Non-Tilt Rollers for straight-line movement. Choose from a variety of sizes and styles. Weight capacities range from 4000 up to 8000 lbs. Caster Style Pallet Dollies provide Transportation of Large Heavy Materials in Garages, Workshops, Industrial and Commercial Environments. 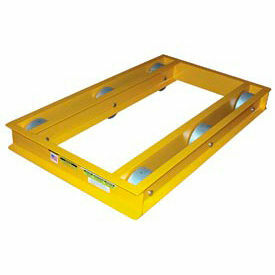 Caster Style Pallet Dollies are made of aluminum or steel construction for long lasting durability. Dollies are available with Open Decks or Solid Decks, with a variety of handle and brake combinations. Capacities range from 900 to 3600 lbs. Wheel diameters are 3", 5", 6" or 8". Wheel types are Mold-On Rubber, Phenolic, Polyurethane and Rubber. Dimensions vary per model. Pallet and Container Transporters Reduce Dependency on Forklift Trucks by providing Mobility for Pallets and Crates. 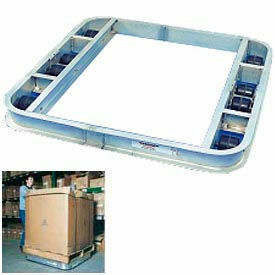 Pallet and Container Transporters feature all welded construction for long lasting durability. Powder coat finish protects steel frame against rust and corrosion. Available in combinations of Fixed Height, Adjustable Height, and Transporter with 40"D Carousel. Deck styles are Open or Solid. Weight capacities are 3600 or 4000 lbs. Heights are up to 38"-48". Casters and other dimensions vary per model. 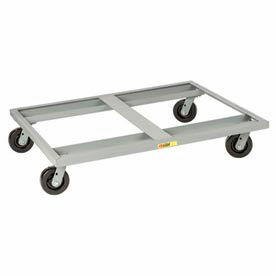 Little Giant® Pallet Dolly with Handle & Floor Lock PDH-4848-6PH2FL - 48 x 48 3600 Lb. Cap. Vestil Steel Pallet & Machine Dolly ODMD-2436-6 36"L x 24"W 6000 Lb. Cap.